I was going to buy a GS coming out of my CTS-V coupe. On paper the Corvette with 460hp was supposed to have similar performance numbers. However, upon driving the base motor Corvette I was just missing the torque down low. I just couldn't do it. The Z for me. You will not regret buying the Z06. I had a 2008 Z06 that I got rid of last year, then decided I needed another toy a few months later, bought a 2015 370Z and it was a fun little car, but it was not a Z06. Then traded that in on a 2015 Mustang GT Premium, it was a better car, but it was still not a Z06 - a little over a week ago I bought my Fully Loaded Z06/Z07/3LZ and do not regret it one bit, absolutely love this car. Moral of the story, once you own a Z06, nothing else will scratch that itch unless you go up into the exotic world which are big bucks!! If it ain't gonna make you eat Top Ramen all the time, miss house payments, stop heating and cooling your home, keep the kids outta college and not be able to buy tires...BUY THE Z! Traded a 911S for Z06/Z07/3LZ and could not be happier. I loved the Porsche but even after a year and 24000 miles I still get excited every time I start the Vette and hear the sound. Then start to move and Wow the power!! You will love the Z06's extra power, even if it is "too much " for all the time. Good luck. I would like to say I drove this home but i did not.. The dark gray interior was a deal breaker.. So Tim and I ordered exactly what I wanted. Blade Silver Z06/Z07 M7 2LT with jet black interior and a carbon fiber dash kit. Order has been placed, delivery end of January. Will also give me a chance to sell my GS on my own. As others said, don't settle, life is short, battling the big C now and so far, all good..
And you will get the 2K dollar incentive to help in your decision. BTW, that's a beautiful pic of your GS. Plus you will have the same drive train warranty as a 1974 Vega or Pinto has in 2016. Putting a blower on a 2017 Grand Sport won't make it a C7Z. It will just be a GS with a blower. No doubt when you try to trade it in, you won't get the value of a C7Z. Life is too short so get the Z06/Z07 you won't regret it. It's an amazing machine! Why not wait for the top dog? You only live once and I completely agree. Before I bought my 2016 Z I had a new Evo X and I just kept feeling like I had settled. 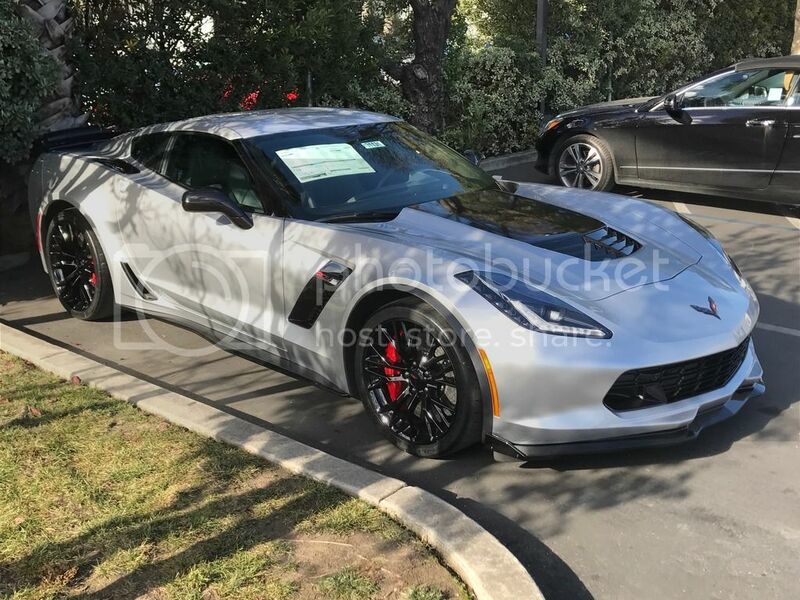 Get the best car you can reasonably afford so you won't have any regrets later in life, there are very few factory cars on the planet that can outperform a new Z06 and it is one of the best bang for your buck sports...er super cars in history. Last edited by Stripeknight; 12-07-2016 at 03:01 AM. I would wait it out another month to see what the ZR1 has to offer. I would hate to see an identicle thread from you in a year wanting to jump to a ZR1. The Z06 will still be here in another month if you dont like what you see. Personally; I regret trading in my modded C6 GS for the hyped Z car. The Z I have now just doesn't have the character that my GS had. Think it over carefully OP. If you really want one try waiting two years so you can break even on the trade in. Good Luck! Well, I would like to say I drove this beauty home but I did not. The dark gray interior was a deal breaker. Instead Tim and I ordered a Blade Silver Z06/Z07 M7 2LT exactly how I want it. It should be here at the end of January. Hang in there pal! Just got back from my dad's pancreatic cancer update, and it really is an eye opener as to how precious life is. He tells me to enjoy life while you can, an attitude that I never really had. I am that hunter/gatherer/save for rainy day guy. That all changed when I got my Z06. You take whatever we can get. Hope everything goes well for you but I think this Z06 will be a great morale boost! And if I don't want to wait until January, Tim has a Watkins Glen Gray Z06/Z07 coming in next week. As much as I like the Blade Silver, the WGG would be my second choice, and it has everything I want. We'll see......have a great day..
Good luck with your battle with Cancer and enjoy the new Z.